Sidhil News: David Lewis and his family take the plunge!! David Lewis and his family take the plunge!! A serious scuba enthusiast, David Lewis our Procurement Manager here at Sidhil has been training with his family for their Professional Association of Diving Instructors Certification (PADI). 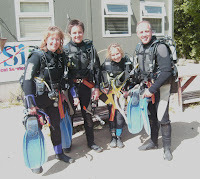 The family achieved the certificate and are now able to SCUBA (Self Contained Underwater Breathing Apparatus) up to a depth of 18mts without a Dive Master. Congratulations to David and his family!